Rekindling a human return to Earth’s moon is viewed as opening the gateway to the solar system. At the heart of the campaign is the Lunar Exploration Analysis Group (LEAG), a group chartered by NASA Headquarters to assist in planning the scientific exploration of the moon. LEAG is organizing a letter writing campaign to Congress to underscore the importance of the moon. The flyer is to be sent, along with a cover letter, to all members of the U.S. House of Representatives and Senate committees that have influence on NASA funding, and to all the lawmakers of the LEAG executive committee members. “We were waiting to see if Chang’e 3 landed successfully and it did! 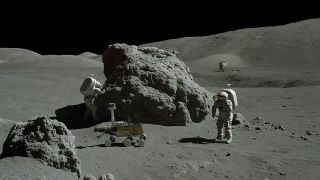 Now we want to champion the moon from the U.S. side,” Clive Neal, a leading lunar scientist at the University of Notre Dame’s Department of Civil and Environmental Engineering and Earth Sciences told SPACE.com. He is a member of LEAG’s executive committee. The Destination Moon movement is predicated on the value of exploring the moon, from opening the gateway to the solar system, pioneering development of new technologies, as well as advancing economic expansion, enabling new scientific discoveries and promoting international partnerships. “The moon is the most accessible destination for realizing commercial, exploration, and scientific objectives beyond low Earth orbit,” the flyer reads. Lunar resources can be used for fuel and life support for operations in Earth-moon space as well as for voyages to Mars and beyond. America can still lead the world beyond low Earth orbit by forging collaborations to make the frontier of space accessible to all. Scientific investigations on the surface of the moon uniquely support studies of early Solar System events that have been erased from Earth’s record. Stephen Mackwell, director of the Lunar and Planetary Institute in Houston, advocates a return to the moon. “The brief Apollo missions were terminated before we could start investigating the requirements for longer term missions away from Earth,” Mackwell told SPACE.com. Independent of the LEAG letter writing campaign, a U.S. return to the moon is getting a political boost from Rep. Frank Wolf (R-VA). In a Dec. 19 letter to President Barack Obama, the lawmaker calls on the president to hold a White House conference early in 2014 to develop a mission concept for a U.S.-led return to the moon within the next 10 years. The conference would bring together “the best minds from around the country and among our international partners” to forge the initiative, Wolf said. “As China prepares to send a series of increasingly advanced rovers to the moon in preparation for what most observers believe will ultimately be human missions, many are asking why the U.S. is not using this opportunity to lead our international partners in an American-led return to the moon,” Wolf said. How United States politics and China’s moon landing of Chang’e 3 play together is far from clear, said Mike Gold, director of Wash., D.C. Operations and Business Growth for Bigelow Aerospace, a private space firm eager to kick up its own commercial lunar dust. Gold told SPACE.com that it’s not a matter of ifthe moon will be utilized for commercial activities, it’s a matter of when and who will enjoy those benefits. “The moon represents an unparalleled commercial opportunity, and Congress should be looking for ways to expand commercial space operations beyond low-Earth orbit," Gold said. "I hope Chang’e 3 inspires a renewed effort for commercial lunar development but I’m afraid the lack of reaction in Washington speaks volumes."